O, hello, nice have you in our virtual appartment. You are just few steps away to feel charm of Piran. I admit - when you meet its small and narrow streets, beautifull Tartini square, small market place and nice fish restaurants - you fall in love in it. The Apartment is in the house which said to be the oldest house in Piran and is under care and preservation of monuments. You can identify it by luxuriant tall palm in front of it. Apart from the outer walls it was fully restored in 2004, equipped with new furniture and air condition so that you won't be hot in hot days, and not cold in cold days. The apartment is light, nice, bedroom is seperate from the day room. There are a kitchen niche and the setee that can be streched into an additional bunk. There is also a bathroom there. Apartment has air condition, TV and a connection for cable TV for gloomy days. 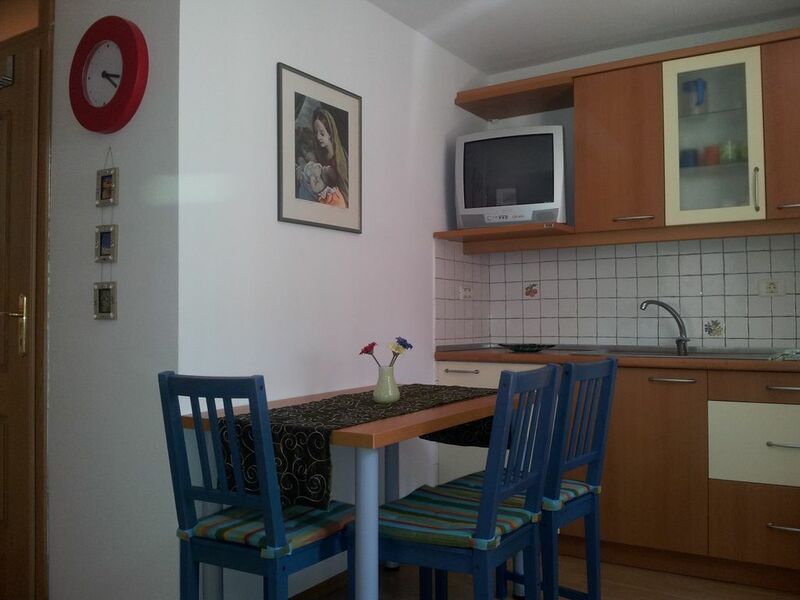 In the apartment there is a room for 2 adults and two small children (sofa in kitchen is aprox 200 x 150 cm). It has approx. 25m2. It is very nice ;-). Our family, who owned this appartment, don't live in Piran. We will arrange everything by e-mail or mobile phone. My mother allways wanted to have small piece of land at the seaside. Her wish come true when she was 60 years old. She bought the oldest house in Piran. She renovated it completly, just completly. Only the walls remain the same. Imagine to renovate the house in Piran, when you couldn't reach the door with the car. Everything come by wheelbarrow and cart. She enjoyed there for more than 10 years. But .... life goes on. She got sick and gave the appartments to her children, so my family got one. Some day, when children grow up and me and my housband will have more time, we'll use this very special flat just for us for some month per year. Everytime we spend some nights there I call my mother and thanks her for such a gift. We are really inlove in our appartment! Hope you'll too. We've had wonderful time in Piran. The apartment is nice and small as advertised, and it is clean, things work and it is close to everything - the main plaza, shops, restaurants, sea. One of the nice suprises was the free bus between the Fornace garage and the centre of Piran, which solves the parking dilemma, since Piran is not generally accessible by car. Piran and the entire area is great for taking nice walks, eating outside, swimming in Adriatic and in general for a romanting getaway. Highly recommended! Dear Milos, thank you for review that shows that all in our offer is true :). Wellcome anytime! We stay for one week with 2,5 years old son. The place is good for small family. Everything you need is there. The place is in the middle of Piran, close to everywhere. Great please to stay. Piran is a beautiful little town with many interesting walks, surrounded by beautiful clear sea, perfect for a relaxing few days. There is a supermarket and choice of restaurants close to the apartment, and not far to walk to the area for transport out of the town. Also it is easy to hire cycles from the town centre, and fun to cycle along the coast towards Potoroz. The apartment was small, but mostly as described, although the aircon did not work when we were there and with the windows open all night, there was general noice from the apartments close by, and also from the rubbish collections in the early morning. The apartment could do with a few extra kitchen items, such as a kettle or coffeemaker - we searched high and low for even a cafetiere in the town but could not find one to buy. There was an initial mixup with the start date of our hire period, due to the owner using more than one site to advertise the apartment, but despite being overseas, Ursa did respond quickly to our panicky texts about having nowhere to stay on the first night, and was able to offer us another apartment in the same block for the first night, before moving into the correct one. Overall, a handy base for a relaxing, simple few days holiday. Stayed for fours nights and had a very enjoyable stay. Ursa is very helpful and informative on arrival and places of interest in the town which we found really useful. The apartment is well maintained and was very comfortable for the two of us. Would definitely stay again. Cleaning is NOT included - 30 €.